I cut the grass this week. And managed a few hours sitting out. It’s keep your shirt on and well buttoned up weather but it feels so nice to sit out and get the feeling of sun on my face. It’s all a bit desolate out there. I dug up the front in order to rebuild the walls and dig some goodness into the soil. All the plants worth saving were potted to survive the winter but most haven’t survived the extreme wet. A couple of blackcurrant bushes and some daisies. A real pity as a lot of the plants that perished were taken as roots and cuttings from my parents’ garden. It was a link that meant a lot to me. I have a few left. I’ll cherish them, grow them, split them and coddle them. Both my mother and father were good gardeners and the sense of continuity is important as well as the sentimental value. Have I kept up the ‘no meat in Lent’ regime? You bet I have. I’ve always known that middle aged people should eat differently but had been too keen to go on a binge celebration of leaving bad things behind that I thought of the net gain rather than the common sense. Old Benson retired from farming when his son took over the reins. This didn’t stop him walking three miles up Furness hills to the farm each day, putting in a full shift and walking home again. He did this into his eighties. He was a phenomenal man and he said (back in the sixties) that you don’t eat red meat once you are past fifty. Modern science, as is so often the case, is catching up with long held wisdom. Carl (a fellow blogger and a darned good cartoonist) comments that it is how long food stays in the gut that makes the difference. Up to eight hours is fine. Over that and it starts producing toxins. Beef, in particular, takes two hours longer than other foods to digest. It makes a big difference to a middle aged body. I won’t go vegetarian this year but I may well have left beef behind. It’s not such a daft idea to drop one type of flesh each year until I’m meat free. During my heavy smoking days I always knew I wouldn’t die a smoker. I’ve long had a feeling that I will end up a vegetarian. At the moment, I am. It’s only for Lent but I’m enjoying it and not missing meat in the slightest. A piece of stilton and a few crackers in the garden start the week off nicely. Stilton is one of many cheeses that don’t require anything else on the cheese board. We’ve got too used to the horn of plenty. Time to change back to having one good cheese rather than a choice. 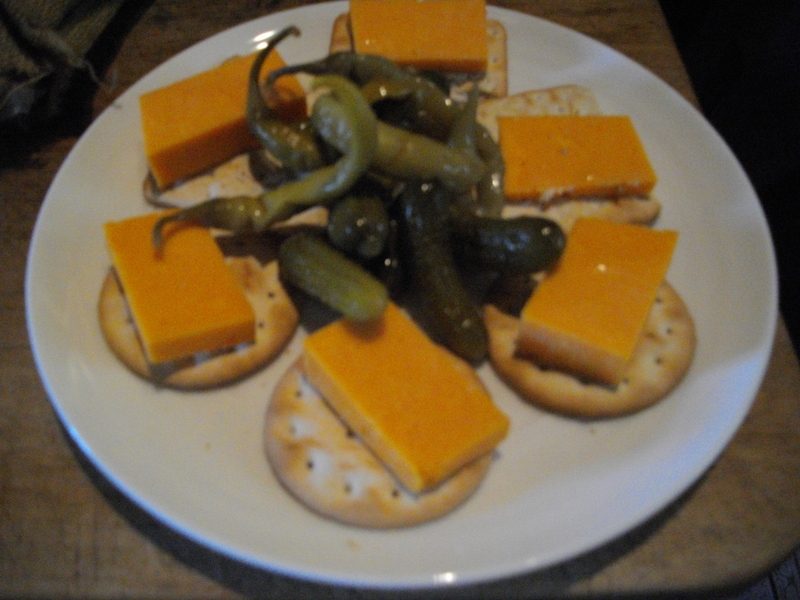 If you add pickles (and here we have some cornichons and some pickled chilli peppers) a strong cheddar is perfect. Strict vegetarians might forego eggs. We’re not strict anythings and are certainly not going to miss out on the first eggs from the chickens in Frances and Steven’s garden. The treat of the week. 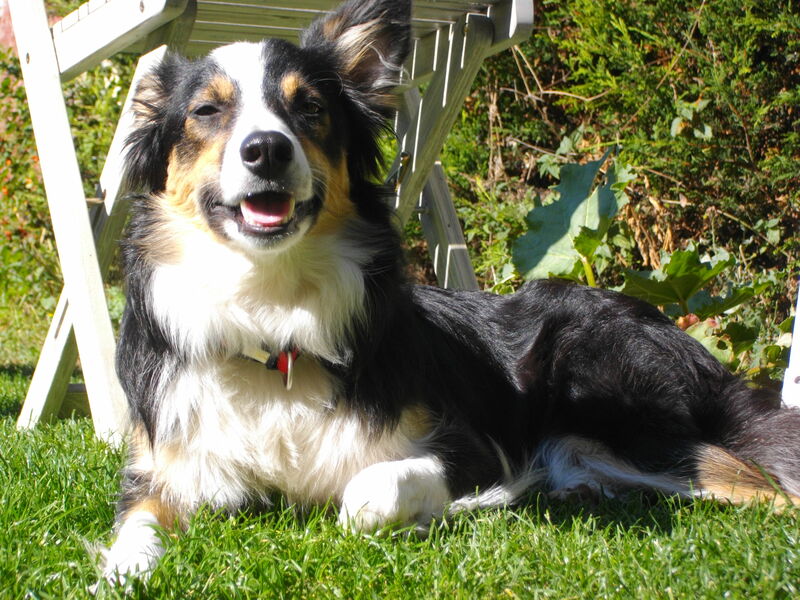 (I was given the honour of naming one and chose Pertelote after the hen in the Nun’s Priest’s Tale). Percy checks the ingredients to make sure I’ve got the ratios right. He doesn’t like pancakes much but he does like being involved. I’d mis-judged the calendar and got caught out. I thought pancake day was going to be the 11th so I stick by the plan. I can remember making pancakes for T during our courting days back in the seventies. I think this week was the first time I’d made pancakes for two in all that time. Well it would have been for two but a friendly sheepdog positioned herself under the table and was a willing recipient of one or two pancakes of her own. We have some maple syrup on the table. Good maple syrup. 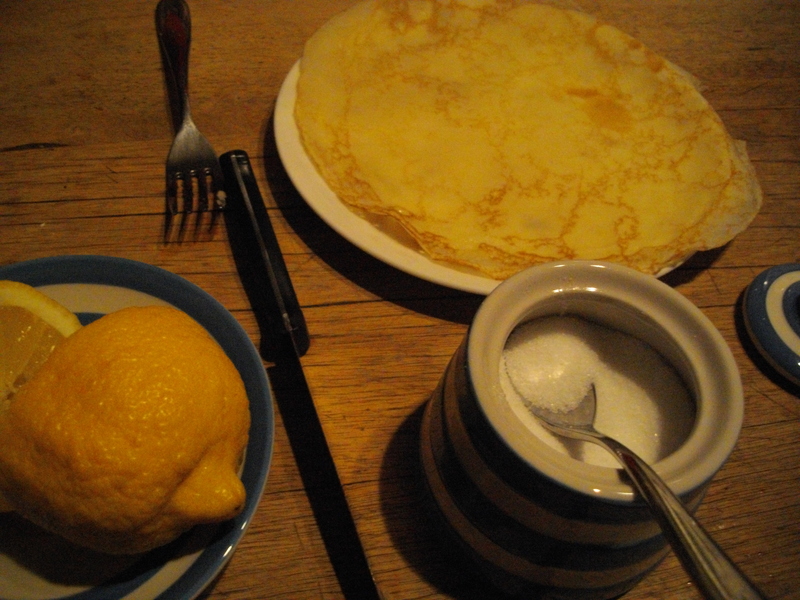 It gets used but sugar and lemon is still the favourite way of eating pancakes in this house. 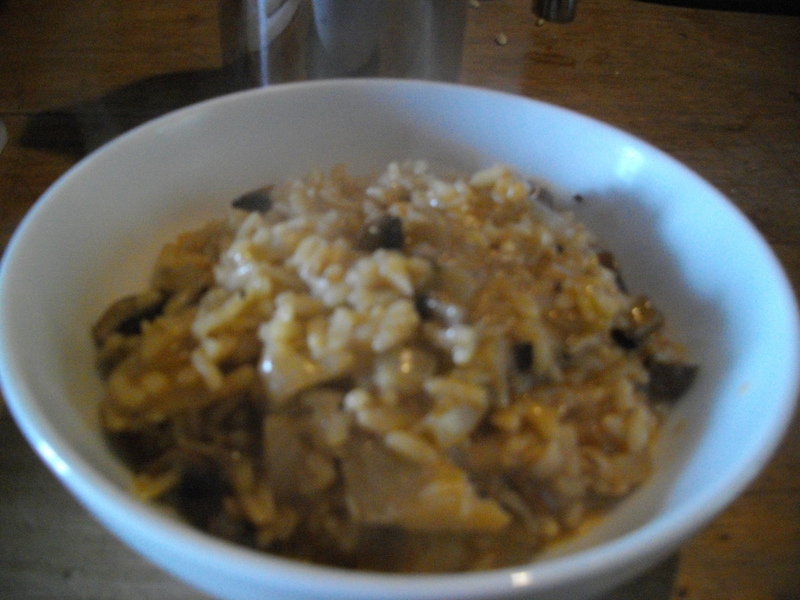 I could eat risotto for every meal for a month and not complain. This one follows the simple method. I don’t have any vegetable stock or stock cubes. I do have some sachets of Ainsley Harriott’s soup in a mug. I use one of roasted peppers and tomato in this as well as adding a couple of frozen white fish fillets. It’s such a simple dish to make and is so useful. Even without a microwave it is so easy to heat up, it is delicious cold and it packs into a tupperware container for the most convenient of packed lunches. Muesli and banana has been my default breakfast this week. Dorset Cereals provide the muesli and a very good start to the day it is. 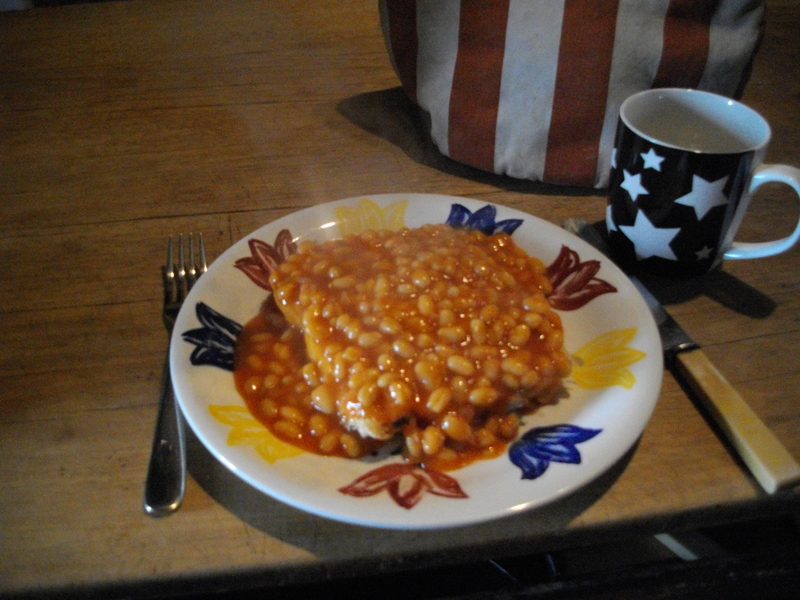 On Wednesday I have a yearning for beans on toast. Who needs bacon or sausages? 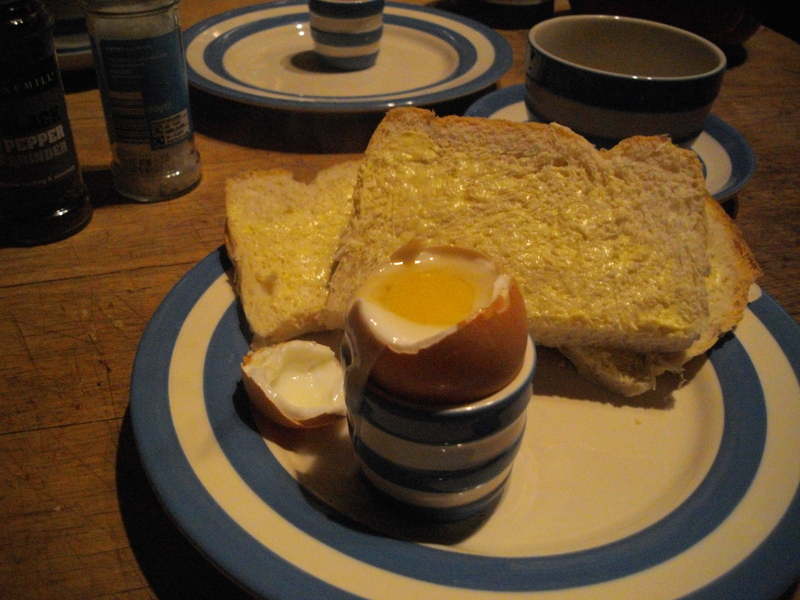 It’s a classic dish in England (not sure about anywhere else) and gets the midweek off to a flying start. By Thursday I need a substantial meal I need the preparation as much as the meal itself. I enjoy fish however it is served but, given the choice I would opt for it to be shallow fried with a cornflake crust on the flesh side. Always buy fillets of cod or haddock with the skin on. Even if you don’t eat the skin it holds the fillet together and adds enormously to the flavour. 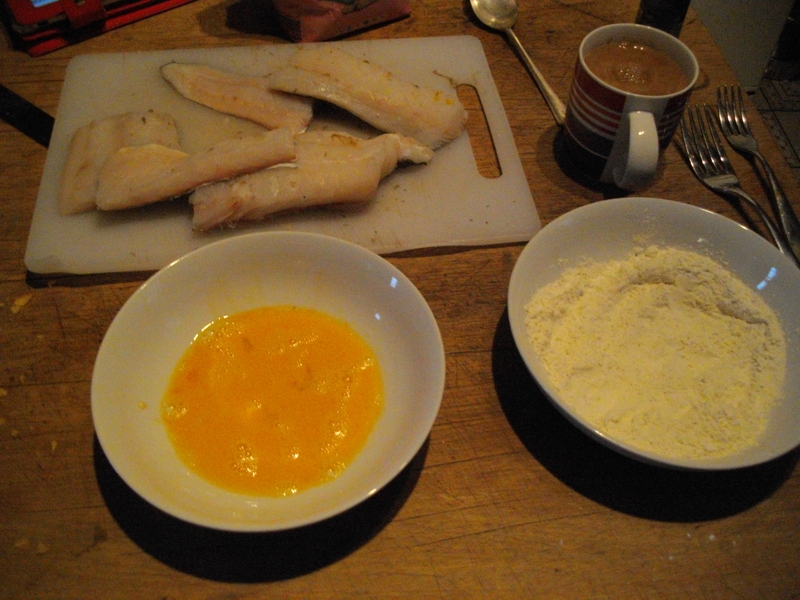 Dredge the white side of the fillet in seasoned flour. Dip it into beaten egg and then into cornflakes which you have rolled fine with a rolling pin. (You can buy crumbs made like this but they don’t improve for keeping and you deny yourself a few minutes of fun. It’s worth t for the sound alone!). 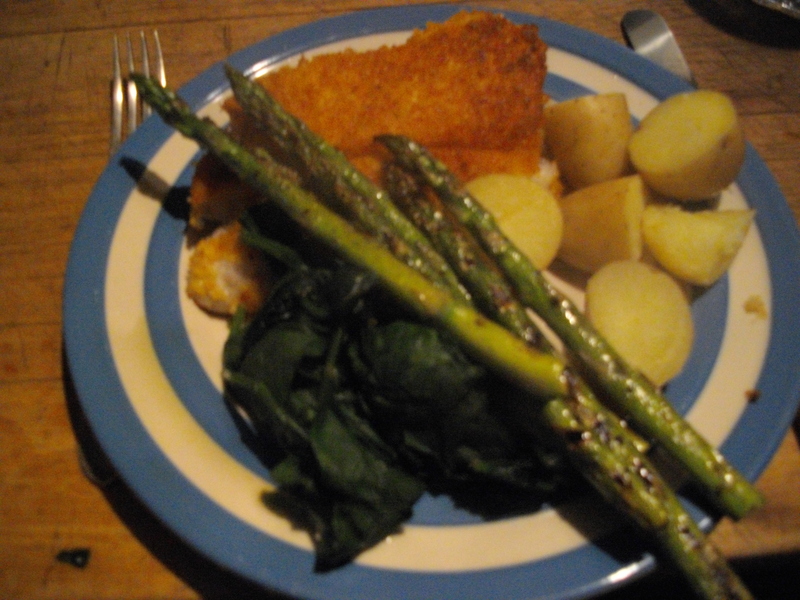 Asparagus, spinach and Charlotte potatoes complete the dish. I was going to make a parsley sauce but was more than happy to settle for some knobs of butter meting on the asparagus and potatoes. On Friday I’m not feeling well. I’d managed to get myself invited to spend the day at Oxford University. I simply can’t go. It seems cruel. I don’t get ill often and it was a day I was looking forward to enormously. I may not be one of the great academics of England but I’m clever enough to enjoy being among people who are. I stay at home and don’t eat very much. 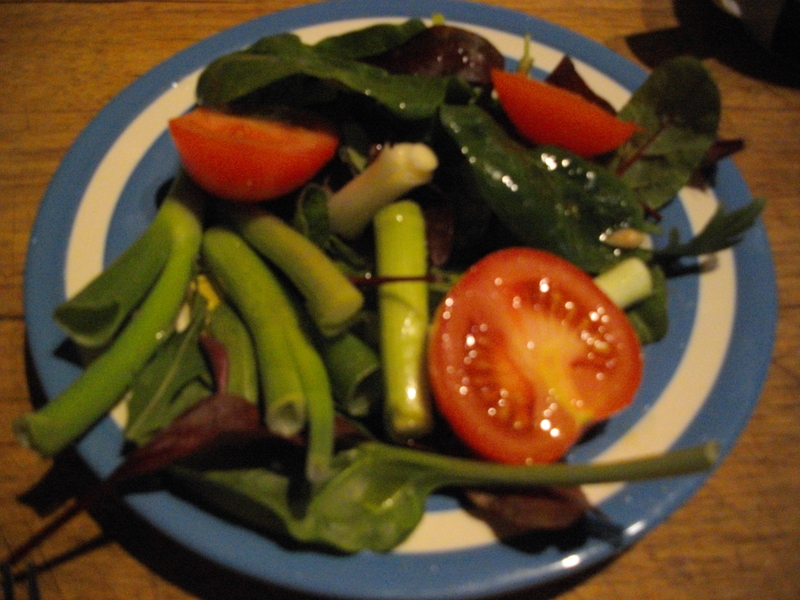 As simple salad with olive oil, pepper and lemon juice does well enough.